Zoë Clarke has been appointed as Lead Healthcare Scientist at Barnsley Hospital. Zoë, 41, is originally from the West Midlands but lives in Derby and has been based at Barnsley for the last 12 years. 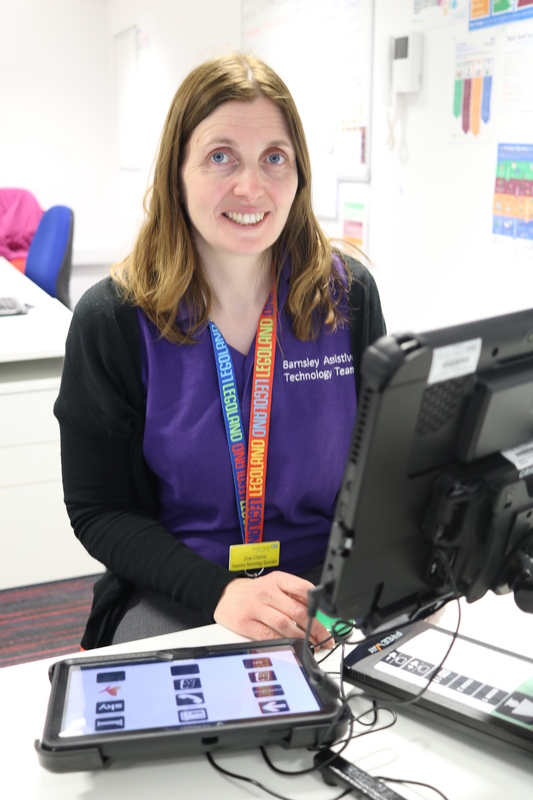 She works in the regional Assistive Technology (AT) Team which covers the whole of Yorkshire and the Humber. The team assesses people with disabilities for electronic assistive technology, helping them increase their independence by accessing for example, TV and telephones. The team also assesses people with no or limited speech for communication aids. Zoë said she was ‘extremely excited’ about her new role. She explained: “Healthcare scientists are a major part of the NHS workforce and are involved in 80% of diagnoses, but there is very little recognition or sight of them. This is according to the UK’s Chief Scientific Officer (CSO) – head of the 50,000 healthcare scientists working nationally in the NHS. The CSO highlights other groups of staff within NHS Trusts have representation at Trust level but that healthcare scientists do not, and so it was planned that all Trusts needed to have a Lead Healthcare Scientist. At the Barnsley Trust, Chief Executive Dr Richard Jenkins and Medical Director Dr Simon Enright agreed. They were both enthusiastic about having this role and so Zoë was appointed. “Healthcare scientists span 51 disciplines including audiology, pathology, clinical engineering, immunology and many more. Some healthcare scientists are patient facing and some are lab based”. “Having just started as Lead Healthcare Scientist I have been busy meeting the teams of healthcare scientists within Barnsley, learning about their work, the departments they link with, the successes, and the challenges. One initial goal is to promote awareness of what we all do via a full week of promotion for Healthcare Science Week (March 8-17). This will include stands in Barnsley Hospital restaurant and outpatients. In 2017, Zoë was awarded a Chief Scientific Officer (CSO) WISE Fellowship, part of a programme to find role models for the next generation of female healthcare scientists and support aspiring NHS leaders. Zoë was one of only four people nationally to be awarded the Fellowship in 2017. The award resulted in her meeting Princess Anne and being part of the NHS 70 Year celebrations at 10 Downing Street.